In A Tiger Comes to Town by R.K. Narayan we have the theme of hopelessness, perception, ignorance, fear, control, freedom and identity. Narrated in the first person, by the tiger who is unnamed, the reader realises from the beginning of the story that Narayan may be exploring the theme of fear. Everybody in the market is afraid of the tiger. Something which is only natural for humans. However through the tiger we learn that there is no need to be afraid of him as he only attacks when he is hungry and he is not hungry at the moment. Though this is of little value to those who are scared. They cannot read the tiger’s mind so fear is a natural reaction to what is happening. This may be important as it is through peoples’ perception of the tiger that they are afraid. They know no better or they are misinformed as to the habits of tigers. 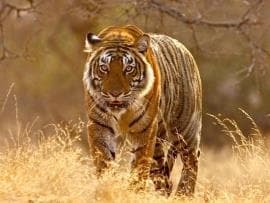 Which may leave some reader to suggest that mankind or at least those in the market are ignorant as to how a tiger lives its life. It is also through ignorance that the people in the market become hopeless. Running around the streets trying to avoid the tiger. Who in reality is harmless. What is also interesting about the story is the fact that the tiger’s master wants those in the market and at the school to question who they are or at least their belief system. The master is unhappy that people are using the words ‘brute’ and ‘beast’ when it comes to describing the tiger. Again this may suggest that people are being ignorant of the facts. A tiger is a beautiful animal. However should a person not be careful. Tigers can be dangerous particularly if they are hungry. Though the master does question how a person can fear a tiger yet not fear man himself. Particularly when mankind has caused more damage than any tiger has ever caused. Man through his greed for power has killed his fellow man. While the tiger will only disturb someone if they are hungry. In reality the tiger wants to enjoy the little bit of freedom that he has before he is eventually captured by his master and returned to the zoo/circus. If anything Narayan may be suggesting that those in the market are acting unreasonably. Through their perception of what a tiger is, those in the market have panicked and ran away. Except for those who sit motionless and afraid in the restaurant. Even the school children are not really afraid of the tiger and appear to be more excited that the school is closing for the day. It is the adults with old beliefs who really instil fear in others. Causing a calamity that amuses the tiger. It might also be significant that the tiger knows that he has control of the market and the school. Where previously the tiger thought humans were ‘strong and fearless.’ This is not the case. A simple incident of a tiger on the loose can cause enough panic and chaos that those in the market disperse as quickly as possible. Forgetting what their intentions may have been prior to seeing the tiger. There is also no doubting that the tiger feels at home in his new environment. Which may be important as Narayan could be highlighting the fact that it is mankind who has taken the tiger’s home. The presence of the tiger ensures that those in the market lose control. Rather than it being the tiger who is being controlled by his master. The perception that both the tiger and those in the market have about one another highlights that mankind feels comfortable when he or she is in control. Yet when mankind loses control of a situation they are as afraid as any animal may be to be captured by man. Narayan has shifted the reins of power from man to animal and mankind is uncomfortable. As is to be expected when mankind has little or no knowledge about any particular animal apart from what they might see in a zoo. Throughout the story the tiger has been the one who is in control. That is till his mater captures him and defends the tiger when others complain about him. It is as though the master is asking society to look at themselves rather than to admonish the tiger for what is only natural to the tiger. In reality mankind (or society) has caused more damage than the tiger could ever manage to do. Leaving the reader to suspect that it should be the tiger who should be afraid of mankind. McManus, Dermot. "A Tiger Comes to Town by R.K. Narayan." The Sitting Bee. The Sitting Bee, 4 Apr. 2019. Web.